Bring the best of the old school into the 21st Century with the Barnes VOR-TX .30-30 Winchester load, featuring the Triple-Shock X bullet! The .30-30 Winchester cartridge is a true American classic, and has been doing great work in lever action rifles forever. Now it has been given an upgrade by Barnes with these excellent 150 grain Triple Shock X projectiles, which provide maximum weight retention, expansion, and penetration. 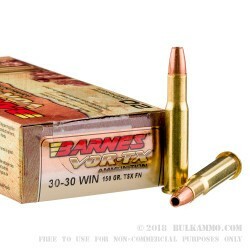 These .30-30 rounds from Barnes are the peak of modern bullet technology applied to a round with a proven track record, truly giving the shooter the best of both worlds. Barnes’ reputation for quality is second to none, and these 150 grain .30-30 cartridges are no exception. 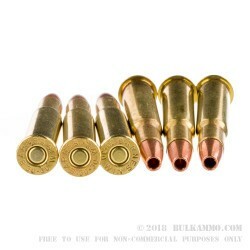 Loaded in new manufactured fully reloadable brass, these Barnes rounds bring all the quality of a handloaded round directly to the retail consumer at a price everyone can live with. 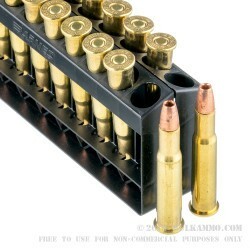 Barnes packs these .30-30 rounds in new boxes with internal separator trays to prevent damage to the projectiles or brass cases. These VOR-TX rounds are the new standard in .30-30 Winchester technology! A: The .30-30 bullet can travel for over a mile and a half, but is only effective against a point target within 300 yards. With proper shot placement and when range to target is reduced as much as possible, it is effective against all but the largest North American game animals. Q: Why is the maximum amount limited to 20 rounds on your site? A: Barnes, the manufacturer of this ammunition, packages 20 rounds to a box. Traditionally, this is how many rounds/cartridges are loaded in a box of centerfire rifle ammunition.